This is a spring outfit that I wore on the only warm day in Plattsburgh so far. It snowed and rained all weekend, so I’m patiently waiting for the weather to get warmer. This crop top is from Forever 21 and was $5.99. The boyfriend jeans were on sale from H&M and were only $14.99, and the shoes were also from H&M and were $25, so all around, good deals! I got this yellow turtleneck for only $5 at Forever 21. Originally, it was $17.99, but I snagged this sweater for way cheaper because it was during their big sale after New Year’s Eve. I love wearing sweaters during the winter time, but the cropped ones definitely flatter my shape more and look great with high waisted jeans. The outfit I’m wearing is a teal colored crop top, which was $5.99 from Forever 21, and these zebra printed loose trouser was only $11.99. I thought it was a cute outfit for a more boho feel for the summer. 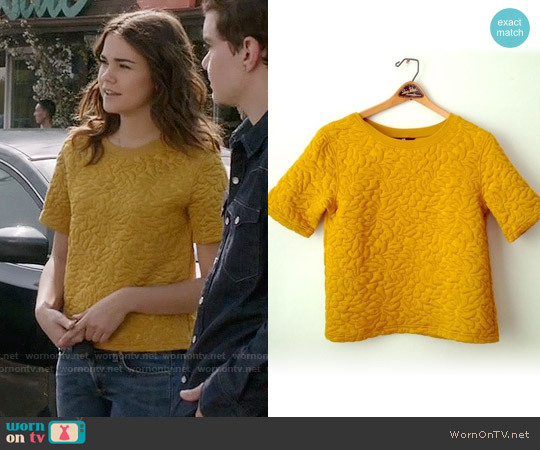 Callie’s yellow top is super pretty. She’s been rocking some boxy crop tops while Mariana has been going back and forth. Her ruffled top is super flirty and playful, while her cardigan and sweater combo earlier was very preppy. Thanks to WornOnTV for their photos and for having the details for the outfits. 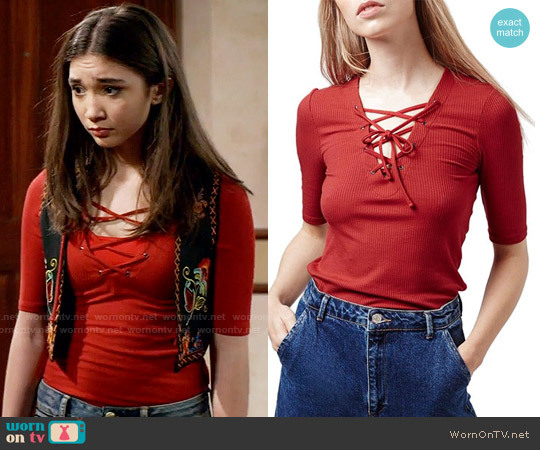 Unfortunately, Callie’s top is sold out, so I left a link to a similar top that I found online. As far as the fashion, even though Riley and Maya wore similar outfits, I liked different pieces more. Here’s what I liked from each of their outfits. For Maya, I really liked this maroon vest. The sequined pattern and velvet is a lot for a vest, but Maya pairs it with a more understated lace up top to balance it out. 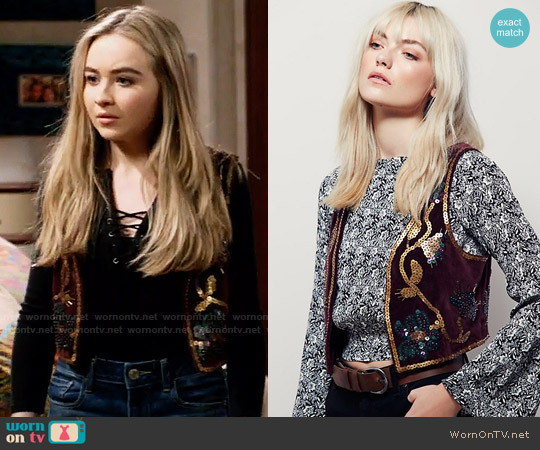 Sabrina Carpenter always adds a more boho vibe compared to Riley’s more preppy feel with her red lace up top. Season 4 of The Fosters kicked off with an intense episode. However, PLL isn’t the only show with awesome fashion on Freeform. 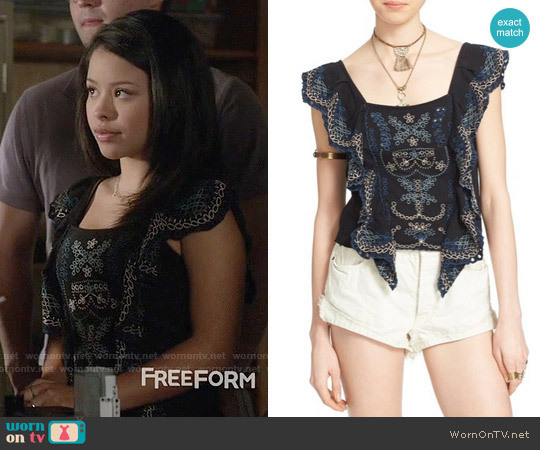 I loved Callie’s and Mariana’s outfits in the episode and went to WornOnTV for the details on their clothing. I love how Mariana’s flirty girly style contrasts with Callie’s more conservative and preppy style. I really liked this boxy crop top for Callie, mainly because of the back of the top. It’s a nice surprise, and it’s also on sale for $18 if you want it! I left the link below the photo. I really liked that Mariana wore this crop top with jeans instead of the skirt for a more casual look. I also love the idea of making a peplum effect with a loose top underneath. Her wedges from Nordstrom were also super cute and tied the outfit together. I’m not a wedge person, but if I were to wear a pair, I’d get these ones. Tonight’s another intense episode and I’m excited to see what happens next. I was very busy in college with classes and finals, so I barely had time to share my outfits from school. Here is a compilation of some of my favorite looks from the school year that I managed to find on my phone. Forever 21 Romper: $12.99: I loved this romper because it was super comfortable to wear out, and then it was really cute during the day to wear with a cardigan and converse sneakers. Rue 21 Sweatshirt: $5.00 Forever 21 Leggings: $3.99: I loved how casual this look was. The sweatshirt was perfect for class and it looks a little bit more put together with leggings and converse. Black Knitted Crop Top: $8.99: I loved this crop top because of the high neckline and the fit. It pairs well with high-waisted jeans because it isn’t too cropped to the point that my stomach was too exposed. Lizard Printed Blouse from H&M: $12.99 Black Trouser Leggings from H&M: $9.99: This was one of my favorite buys from the spring. The reptile printed blouse is fun and quirky. The pastel and neutral colors also gave the look a more spring vibe. Forever 21 Blue Dress:$12.99 Khaki Jacket by Love Tree: $19.99 Forever 21 Necklace: $8.99: The khaki jacket is great because it pairs well with dresses and skirts. The dress is also cute enough to wear both formally and casually. Studded Collared Blouse by Mine: $14.99: For a more professional occasion, I wore my hair in a high ponytail to showcase the studding on this blouse. H&M Cardigan: $11.99 Forever 21 Necklace: $3.99: For a more preppy look, I wore this beige cardigan with white piping on the neckline and down the buttons. Rue 21 Pink Tank Top: $5.00: This was just a light airy top that I found in the clearance rack of Rue 21.